Gold and Gold stocks have been slammed. We have not initiated a NUGT Trade since Pre- Brexit and that worked out to the tune of a 25% gain for us in a few days when we closed it out. We can see the Bullish Percent Index reading is at 17% now, as opposed to 100% back in July. This means everyone has thrown in the towel on Gold stocks/Miners (GDX ETF). Also, we have a fibonacci convergence in Gold which is where two different time frames and pricing structures meeting around the same pivot low. At 1240-1250 area we have that situation now for Gold. The US Dollar also has gone near parabolic and testing 2016 highs. All of this adds up to lower risk and high reward for NUGT if we hit it. Since its still volatile and there is a shot Gold breaks 1240… though seemingly unlikely, we are going to advise a 5% position size or 1/2. If you normally put $10,000 towards a full position you use $5,000 here for example. 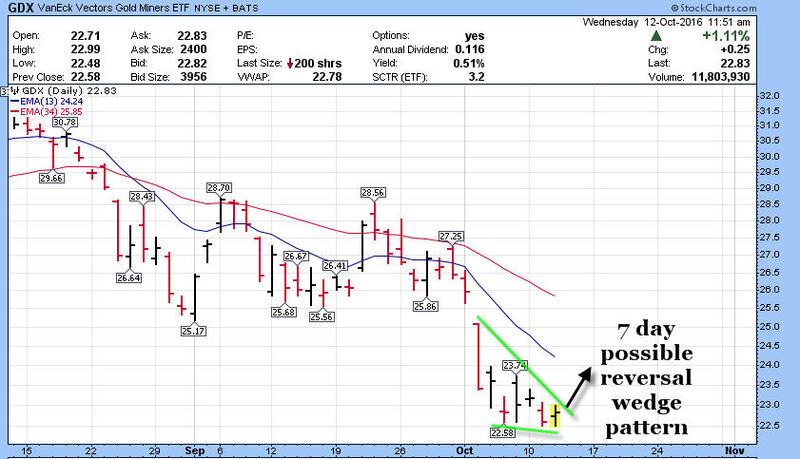 GDX ETF chart below which we use to base on NUGT trade set up on.